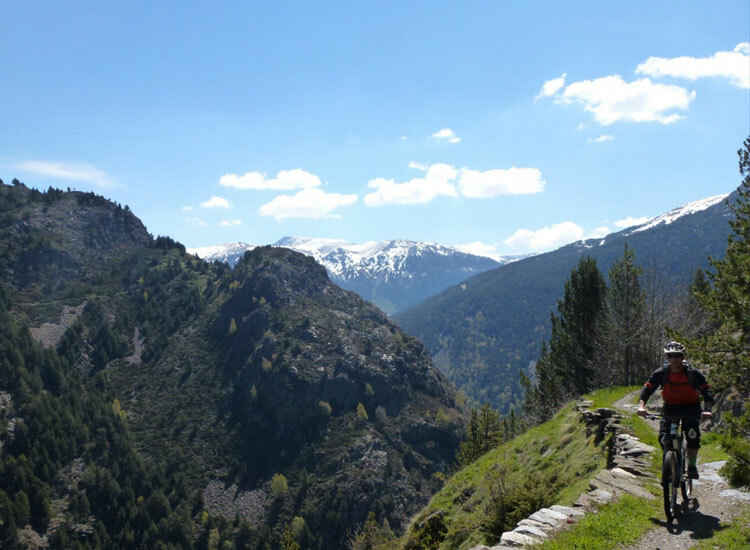 Andorra is the most difficult place you can imagine trying to navigate without a guide – there is no official mapping, and the ones which do exist all contradict each other, and are very inaccurate. Additionally, almost every valley below 1800m is covered in thick forests, so you can’t even see where you are! 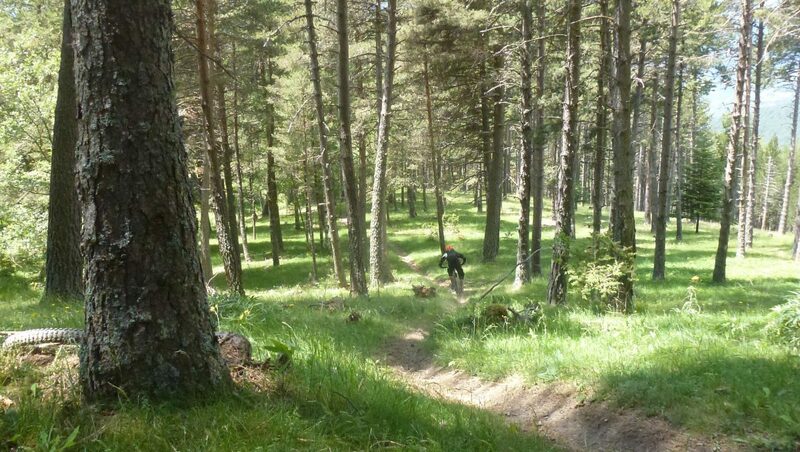 However, it’s this which makes Andorra almost unique in Western Europe – our trail network is almost deserted, other than by a few locals and guided walkers. There’s no lack of trails once you know where to find them, but they simply don’t get much use. The only busy trails tend to unrideable walking routes up in the craggiest areas, where you wouldn’t want to be with a bike anyway! This means that almost wherever we ride we barely see anyone at all. We take you to phenomenal singletrack in every corner of this tiny country, yet we have genuinely had weeks where we have not met another trail user! 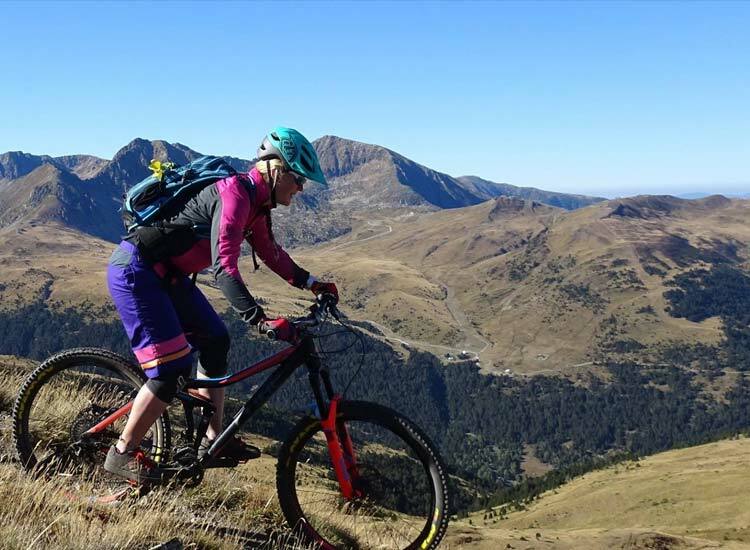 You are going to be amazed, not just by how good the riding in Andorra is, not even by incredibly beautiful and unspoiled it is: mainly you are going to wonder “why the hell have I not ridden here sooner?”! 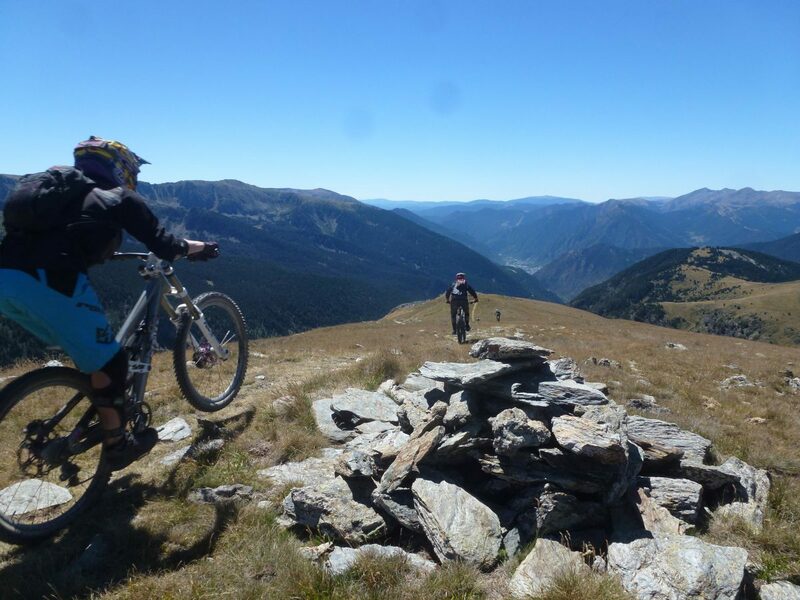 We have gradually evolved our Andorran Holiday over the past few years – it has become a trail rider’s dream, with perfect natural singletrack unfurling under your wheels at every corner! See the bottom of the page for info on some of our favourite rides, but we always tailor each week to the group we are riding with, in order to give you the best possible holiday. We gradually increase the difficulty of the riding so you go home full of confidence and new-found skills. Our 6-times-a-day free transfer service from Barcelona airport brings you directly to the door of our fantastic, bike-friendly 4-star hotel at the heart of the small town of La Massana. Nestled deep in a beautiful wooded valley, the town sits at the foot of enormous mountains in every direction – you can descend over 1000m from the peak of nearby Cubil to the hotel door, without turning a pedal. Our accommodation is based 10 seconds from the main lift station, and is surrounded by lots of great places to eat and drink. 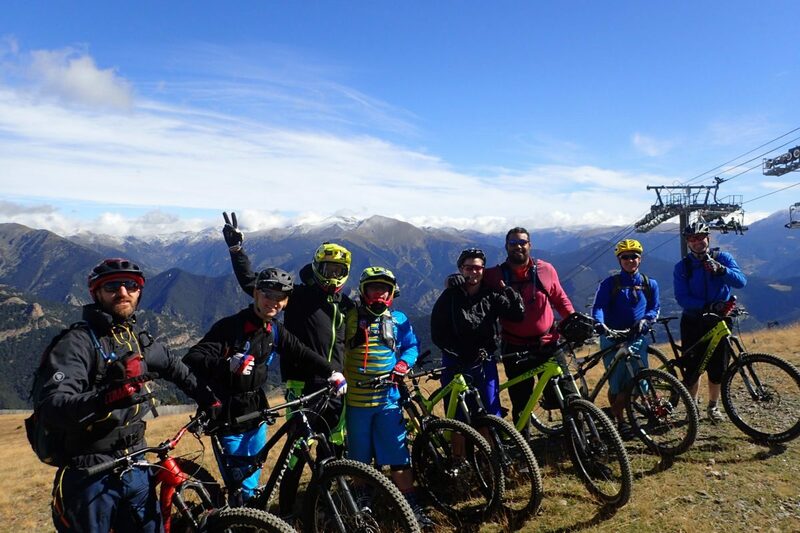 It is Andorra’s busiest & best positioned summer town, full of fellow riders enjoying Vallnord Bike Park, host to the 2015 MTB World Championships and now an annual World Cup venue. Despite the budget-focussed accomodation you are still based absolutely in the centre of La Massana. As mentioned earlier this is Andorra’s most vibrant and lively summer town – it’s not an out of season ski resort, it is a fully functioning small town filled with shops, restaurants and bars. The locals are incredibly bike-friendly and you are guaranteed of a warm welcome – especially in the hotel, which is family run, despite being very new, and is ranked number 1 in TripAdvisor. BASiC stands for Bike And Stay incredibly Cheaply – and other than simple accomodation, this holiday is identical to our famous, full-blooded 4* Holiday. All guests on both trips ride together, you still get exactly the same airport transfers, daily vehicle uplifts, the best guides in the business and some of the finest riding on earth… but instead of our traditional high-end accomdation you stay in a locally run budget hotel. 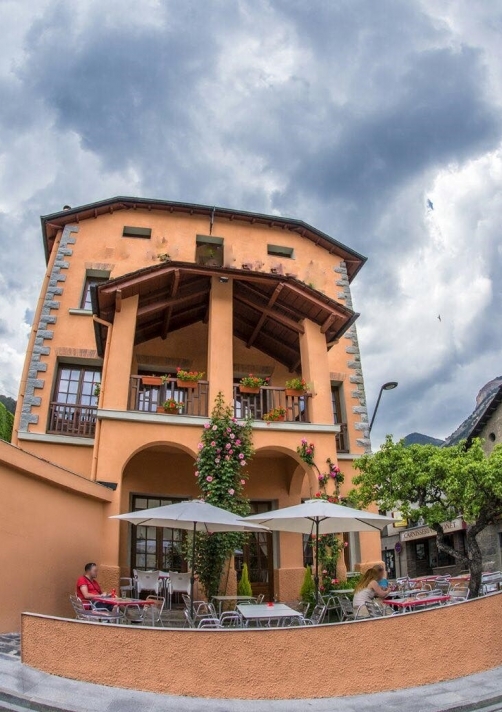 This hotel is located only 2 minutes walk from the 4* hotel, right in the centre of La Massana. This option is ideal if, like many people, you don’t have nearly as much interest in luxury as you do in riding your bike! Rather than staying in our usual shiny 4 star hotel we instead accomodate you in a very simple, family run local hotel. These are deceptively known in Catalan as a “hostal”, but it’s not a Hostel in the english-language sense: you get your own room, and there is a bar/ restaurant. The accomodation is clean and tidy, but stripped back to basics- so it’s not going to be anywhere near the quality of our main accomodation, but it does the job fine! There is bike storage, but unlike guests at our 4* hotel there’s not much indoor bike “working” space, and you haven’t got direct access to our mobile workshop equipment – again, this is at our main hotel. Please note that this option is still INCLUSIVE of breakfasts in the hotel – but unlike our 4* hotel it’s a more simple continental affair. The rooms typically accomodate between 1 and 4 people, and the hotel is located right in the centre of La Massana, with an outdoor terrace at street level where you can enjoy a beer – there’s usually plenty of riders using the hotel bar between runs at Vallnord for exactly this reason. It’s only a hundred yards from the centre of the town, moments from the bike shops, lift station and the 4*hotel where other guests stay. 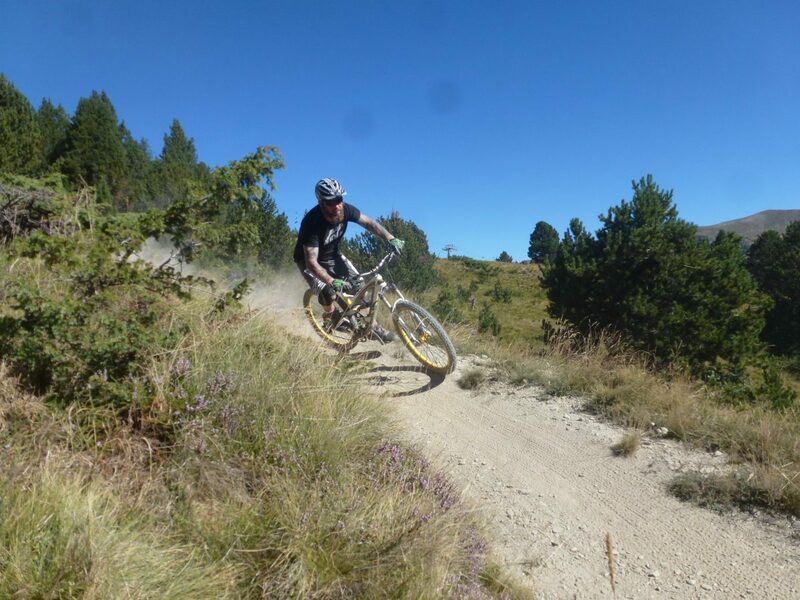 It is opposite a small town square with a creperie and historic buildings, and if you are emerging from riding the secret natural singletrack at Vallnord with us you return straight to the front door of the hotel from the end of the trails! There’s a host of local cafes, bars and restaraunts within very easy reach too. Location-wise, this accommodation offers us an opportunity to really mix up our routes, making use of our unparalleled local contacts – we will sometimes ride direct from the door, and at other times we’ll load your bikes into vehicles and head further afield too. Andorra is incredibly mountainous, but we don’t spend much more than 20 minutes or so in the van at any time. We often do point-to-point rides where we start and finish in different locations too. La Massana sits in the junction of several huge valleys, and mountains tower all around. This means that there are several amazing descents which return you right to the front door – most of which descend around 1000 vertical metres! After an amazing day on the trails you’ll be more than happy to head back to La Massana for a cold (and cheap!) – beer from a frosted glass! If you need spares there are lots of big, well stocked bike shops. Remember that Andorra is basically tax-free, so there are sometimes genuine bargains to be had! You can also rent high quality bikes here – unlike many shops in the Alps the machinery is top quality, well maintained and usually current season. You’ll find loads of brands including, of course, our sponsors Santa Cruz; the famous company are really pushing locally and seem to be taking over the town! We have a hire page elsewhere on the site for the hire partner with whom we work if you want to arrange a shiny carbon Bronson or other models for your visit too..
Another benefit of La Massana is that you can jump on a very cheap bus almost outside the hotel and be in the capital city – La Vella – in less than 10 minutes. The city is famous as one of the premium duty-free shopping destinations in the world. There are hundreds and hundreds of shops, from big-name brands to department stores…even bike shops! Prices are quite a bit cheaper than the UK – and you will find that the dozens of electrical stores will even let you haggle if you need a new gadget. Also in the city you will find Europe’s largest Spa baths (The Caldea) which are enormous, great fun and are always well-loved by everyone who visits them – it’s not “just for girls” – we couldn’t get the boys from Dirt to leave! Eating and drinking in Andorra is remarkably cheap – think Spanish prices, minus VAT – so to give you a few examples: a large beer is around 3E (£2), tapas is available from 4E (£3) per dish, a full-sized pizza in a nice restaurant is 9E (£6), main meals in most places start from around 10E (£7) and if you go to the very best restaurant in town and eat the very most expensive dish on the menu you will still only pay around 25E (£19)! Our Andorran guided holidays have 3 price points: these simply reflect the amount of uplift (gaining height be vehicles and lifts) which you can expect in those weeks. Mostly this comes down to lift opening dates – we still use vans for uplifts in cheaper low-season weeks, but there may be routes which we have to adapt and do a little more climbing in order to access the highest areas. In higher season weeks we use maximum uplift in order to achieve a huge amount of descending in comparison with how much pedalling there is – we aim for at least 3 times the descending to climbing…and some days we do not climb at all! This year is our 10th anniversary, so to celebrate we are giving you our BIGGEST DISCOUNT EVER! Book by May 1st to get £100 OFF any week marked OFFER on this prices chart! If you book more than 5 places we wil give you an extra discount – a simply nutty £120 discount per person! FIRST COME, FIRST SERVED – and you must quote APRILFOOL2019. Short breaks get a reduced discount (£50/£60). These weeks are before or after the lifts are open fully. On several days we use some vehicle uplift for high start/ low finish rides, but on some days there is more climbing at a gentle pace and we make alterations to our route choices to reflect the extra effort. Certain big-mountain routes involve longer climbs avoided in higher priced weeks, but no areas or major descents are inaccesable. For example, “Jordi’s Way” & “Ridgeliner” are accessed via van uplift followed by an extra 500m of climbing normally done by two ski lifts. These mid-season weeks are traditionally slightly quieter weeks. There will be a mixture of vehicle uplifts for high start/ low finish rides, plus use of ski lifts on certain days, but these may only open on certain days of the week. These rides will feature some form of uplift every day, but there may be certain routes that have less uplift than normal if the lifts are not fully open – for example “Jordi’s Way” and “Ridgeliner” require extra climbing normally done by ski lift. Some routes may be slightly shorter than in high-season weeks, as certain linking lifts we use to add additional descending in high season weeks may not be open. 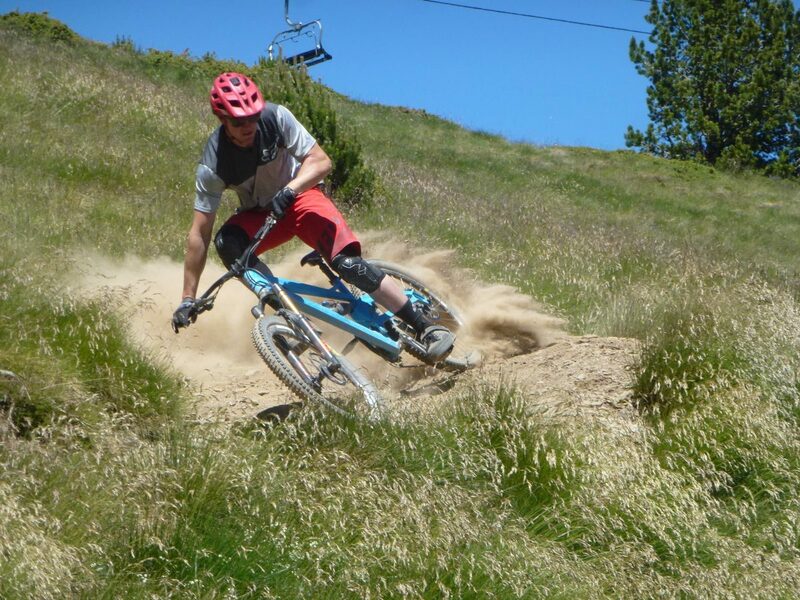 These high-season weeks have heavy use of ski lifts and/or vehicle uplifts every single day for high start/ low finish rides and involve minimal climbing! If you are wanting to maximise your descents, and minimise your climbing these are the ones to go for as we have the widest uplift options available. During these weeks we aim to achieve at least 75% descending every day, and some days are entirely uplifted! Some short climbs of upto 30 minutes or so are still neccesary mid-route on our biggest backcountry trails, but this is minimised wherever possible – but, of course, there are not always lifts or roads to the very top of highest trails! Feel like you are starring in an MTB movie! Can you ride "The Slab"? "21 Questions" - can you clear all the switchbacks? Watch the singletrack unfurl infront of you at every crest! ....spiced up with some technical rock gardens! The toughest trail we guide on - anywhere - not for the faint hearted! No climbing. Nada. Zip. Zero. Zilch. Ride trails that even the locals don't know exist! Smooth and flowing...rocky and gnarly; hidden deep in the trees there's something for all tastes! "...the most perfect sun-dappled loamy singletrack any of us had ever ridden."